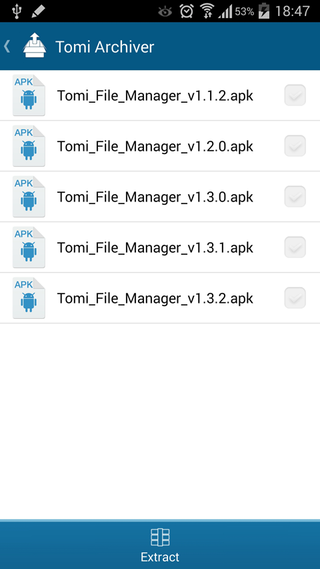 Compressing and extracting archive file are two necessary features to a file manager for Android, sure our Tomi File Manager supports the two features now. Besides developing functions, what we considered is how to perfectly combine using scenes in high frequency at use side with each feature of product. Compress and Share, is the first idea comes to our mind. While sharing files or folders, normally, we need to create a temporary folder at first, and copy all selected files or folders to this folder. And then we compress this temporary folder as a zip file, and share this zip file to others at last. Now using our Tomi File Manager, it turns to be a very easy progress. What you need to do is just select folder or files, and then tap the Share option. Our Tomi File Manager will help you to “Compress and Share”. For example, while you select more than one file from special category (e.g. music, pictures, videos, docs, or download) to share, you have free right to share directly or share after compressing. If you select “Compress & Share”, Tomi File Manager will compress all selected files as a zip file, and then prompt you the sharing options. Archive files is different from normal files on mobile devices, our Tomi File Manager enable you the most intuitive way to preview all compressed files in archive folder. For example, after received archive file through other file transfer tools, our Tomi File Manager can open this kind of file and preview files in it just like open a local folder. Before extract compressed file, I will open the archive by Tomi Archiver to preview at first. While find out file I need, what I need to do is just select it and extract. Tomi Archiver will extract the completed folder structure to appointed position, and only the selected file will be extracted. And furthermore, I can also simply extract all compressed files in archive to the folder, and search the file I want. In a word, Tomi File Manager supports the simplest feature to manage archive file beside basic compress and extract features.